One of the things they both excel at is the amazing array of “pappu” they whip up. Pappu means dal in Telugu. 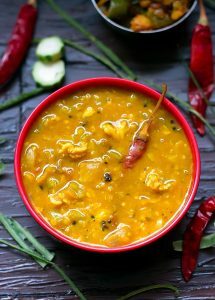 I present a recipe for the “Beerakaya pappu”, ridge-gourd with lentils. It is an absolute massage to the soul. Typically spooned on top of rice, can be had with roti, or if you’re like me, I simply pour it into a bowl and eat it (call it a soup if you are really compelled to call it something). Close the pressure cooker and let it cook for 3 whistles (in the Instant Pot, pressure cook on medium for 6-7 min). Turn it off and let it sit until the pressure fully subsides. This extra soaking in the steam lets the ingredients cook in their own juices. Open up, give everything a little bit of a stir, scoop into a bowl, garnish with a slice of lemon and chopped curry leaves and coriander leaves, and serve. I have been experimenting with various oils of late. If you want a Telangana twist to it, use Safflower Oil (also called Kusuma Noone). For the Andhra tinge, use Groundnut Oil (also called Palli Noone). These oils really bring out the regional flavours. This dish is as soulful as it is versatile. You can substitute the ridge gourd with any soft squash of your choice (you will need to vary the size of the pieces based on their softness), you can also substitute with any green of your choice. My mom makes a heavenly version of this with spinach. My other favourite version is with Gangavaila koora (purslane leaves) which grows like a weed in Hyderabad.